We are currently looking for a mobile gaming enthusiast with an interest in gadgets and mobile devices plus experience with vlogging. There is a fantastic opportunity for the right candidate to help produce a series of YouTube videos for our pegg device. The successful candidate will be required to create a series of fun and engaging videos showing pegg being used in various gameplay scenarios. These videos will be shared via YouTube, social media and our blog. If you think you have what it takes, get in touch or even better send us a vlog telling us why we should hire you! Pegg Electronics are team who are passionate about providing innovative and creative electronic gadgets. These devices and tools will assist you in your gaming, photography, and film. Pegg is available in three versions ‘pegg Classic’ and ‘pegg Rapide’ and our latest version ‘pegg Turbo 7’. 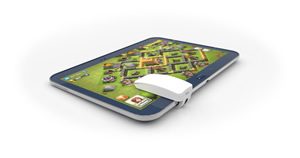 ‘pegg’ – an electronic gadget that will clip onto any touch screen device and simulate a finger touch every 10 seconds. ‘pegg Rapide’ will go on and on tapping at a rate of up to 20 times per second. Our latest model ‘pegg Turbo 7’ has 7 speeds which at its slowest will tap once every 1.5 seconds and fastest setting is 30 times per second.